"Don't call me Lord Snow!" I started watching Game of Thrones back in 2011 when the first season was released and instantly fell in love, it was everything I ever wanted from a TV show. I then delved into the ASoIaF books and they are now some of my all time favourites! Despite my enjoyment of the show dropping off from season 5 onwards (the writing just isn't as good), I still enjoy it and really wanted to make some of the characters from the show. Jon's chapters in the books are some of my favourites, and his scenes in the show are always a delight to watch! Kit has such a challenging face to get right, and he has definitely been one of the sims I have worked on for the longest time. I hope you guys think I've captured his likeness well, as I've sure as hell put a lot of effort into him! The hair mesh by PeggySims has been included for your convenience! The link in the credits goes to the Drew-Cricket recolour I have used, as PeggySims is no longer available and the mesh has been uploaded here. The Skinblend I have used on Jon is by me and is available on my tumblr here (along with preview images). It contains textures from Needlecream, Lilith, Mouseyblue, Trapping and Adalae. Jon's eyes are an edit I have made, they are Burgatory's Edited Polaroid Eyes on Anva's Sclera. The beard edit uses a combination of textures from SimpleLife and Lilith, it comes in one colour (black) and is available from teen to elder. The hairline is by me also, and comes in one colour (black again) and is available from toddler to elder, meaning Jon will look okay no matter what age you have him in your game! Jon's eyebrows are made by me, they also come in one colour. Neither the brows nor beard are binned. Now onto all of the rest of the goodies that I made especially for Jon! I have recreated the uniform that the men of the Night's Watch wear throughout the show. The outfit uses a mesh by Tig, which can be downloaded here (can be found in post #4 in the comments, the file you need is located in 'DP-Men-Imagine.rar'). 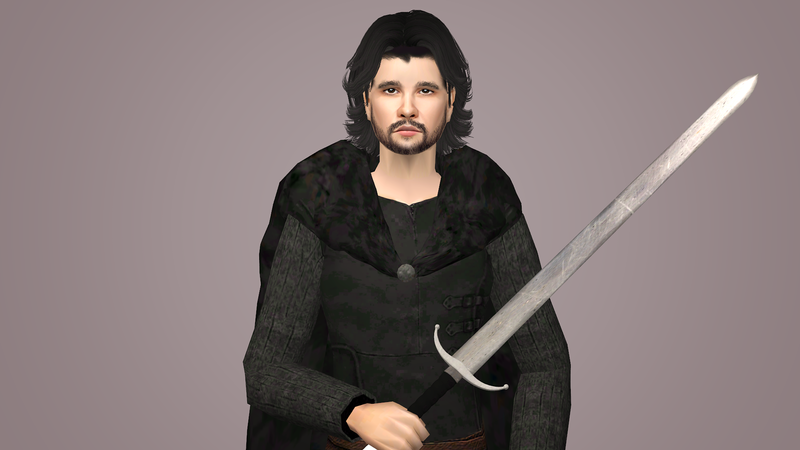 The mesh is included in the Jon Snow Sim download, however if you just want my recolours and not Jon then you will need to go and download the mesh. Textures are from Skyrim and EA. Clearer images of the Night's watch uniform sans cloak can be found in the attached images section of this thread. There are two different recolours, the difference between them is rather subtle, with one being slightly lighter and having more of a brown hue. 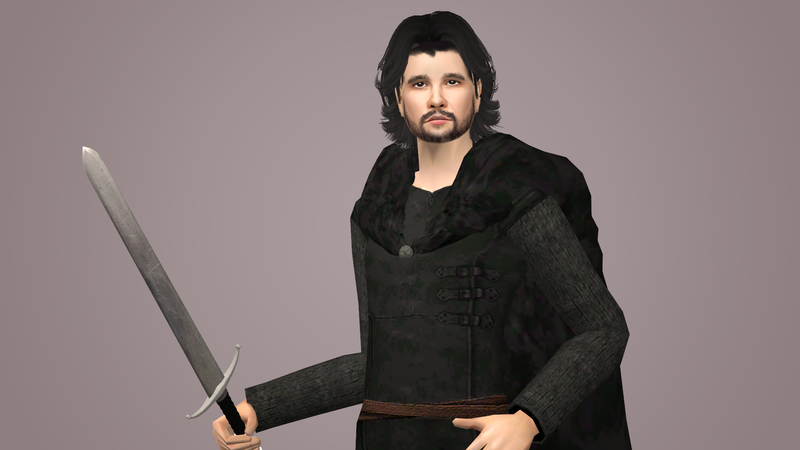 Jon's Longclaw sword is a frankenmesh by me, consisting of the Longclaw Hilt by marko-zuzic-bj (permission via Royalty Free License) and the Sword Blade by Nixed Sims. A massive thank you to simmer22 for helping me finishing off this sword and getting it into game! (also for your awesome tutorials). This is a simple mesh edit of the Skyrim cloaks converted by TheNinthWave (which can be found here). My mesh edit allows the cloak to hug the shoulders better, and I also added a clasp to the cloak to give the illusion it was being held together (rather than just resting on the shoulders). The mesh is a replacement for TheNinthWave's, so you can only have one installed at one time! Wiccandove also recoloured these cloaks using textures from Skyrim (original post here), which you can download if you wish to (they work fine with the mesh edit). 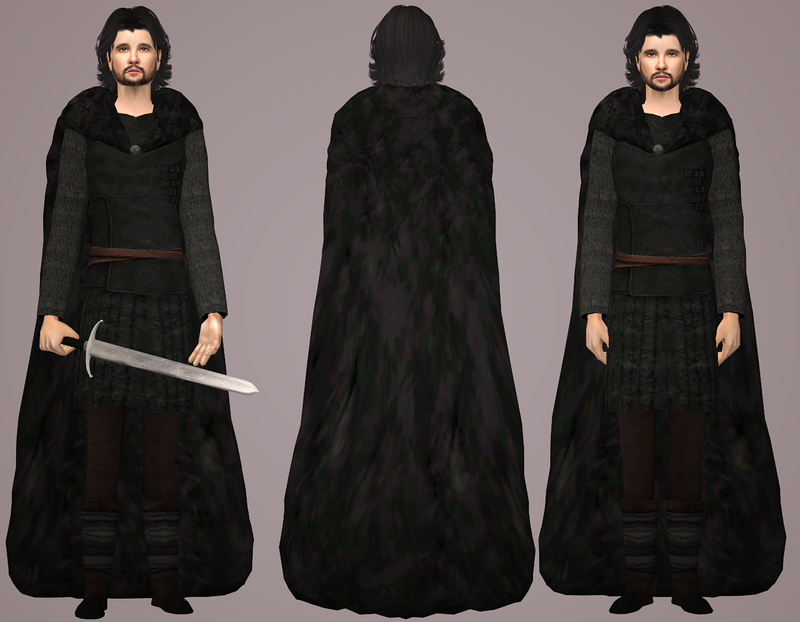 The black night's watch cloak recolour (by me) is included in both the sim download and the mesh edit download. Thank you to everybody who helped me finish Jon, in particular all of you over at the Creator Feedback Forum: Zarathustra, Liz, LyleSnake and grinevilly! Also thank you to MTS for being awesome! YAY! He's finally complete! Great job with the finishing touches! All this time waiting for him, I kept thinking, "Winter is coming". At last! Finally! Winter is here! He looks great, thank you!! Thank you very much! I'm so glad you like him, I couldn't have finished him without your help and everybody over at the CFF. I also hope you like the cloak you asked about and that it fits your purposes! Winter is indeed here haha! Thank you all very much, I'm so very happy you like him (and the sword)!